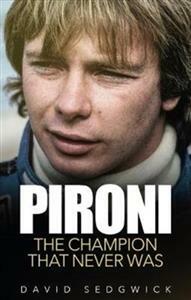 Pironi: The Champion that Never Was relates the remarkable story of motor racing's forgotten man, ex-Ferrari F1 driver and offshore powerboat racer, Didier Pironi. The book charts an incredible journey which took the young Parisian to the heights of triumph and the depths of despair. Before he joined the legendary Ferrari stable, Pironi was already a Formula Renault, Le Mans and grand prix winner. By 1982, the time had surely come for the enigmatic Frenchman to become his country's first Formula 1 world champion. He was to come tantalisingly close to achieving that lifetime ambition, ahead in the world championship and in pole position for the German Grand Prix - before crashing so disastrously in practice. Over the next five years he fought a long and painful battle to return to the cockpit to reclaim the title that had eluded him that grim morning. It was not to be. Thereafter Didier turned his attention to offshore powerboating where his remarkable life would come to a shattering end in the icy waters of the English Channel.